Capsicum, a genus of plants, from four species of which are obtained as many varieties of the so-called cayenne pepper. The name capsicum is also applied to the product itself. The genus is of the solanacece or nightshade family, and has no relation with the family of piperacece, which furnishes the real peppers. 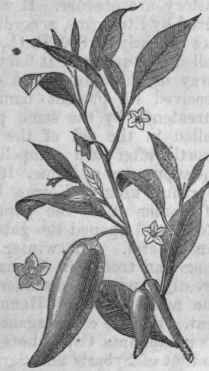 The four species referred to are C. annuum, C. frutescens, C. ce-rasiforme, and 0. grossum. The first two only are of importance. The first is an annual herbaceous plant, remarkable for its hardy nature. A native of tropical countries, in which it thrives luxuriantly in dry and poor soils, it is also cultivated in almost all parts of the world. It grows 2 or 3 feet high, and bears a pod or seed vessel, called also its berry, of ovate or conical form, recurved at the end, green when immature, but bright scarlet or orange when it ripens in October. It is used in the green state for pickling, and in medicine when ripe and dried, and is ground to powder to make cayenne pepper. In England the dried berries kept in the shops are called chillies. This variety is imported from the West Indies, and is raised in our own gardens. Its product is hot and pungent, but without aroma. 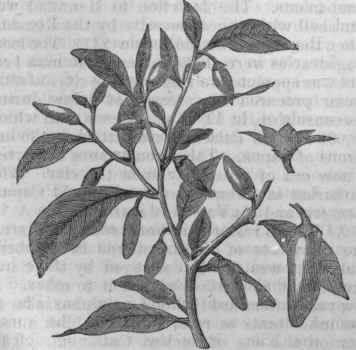 G. frutescens furnishes the so-called bird or Guinea pepper, a hotter and more pungent and better flavored article, and to some extent aromatic. The plant is a shrub, best known in the East Indies. The berries are scarcely an inch long, and only a line or two broad. They contain each about a dozen reniform seeds. - The active principle of capsicum, called capsicine, is a volatile liquid, thick when cold, but very fluid before it disappears by heat in fumes. The vapor is so pungent that what is produced from half a grain, when dispersed in a large room, will cause all present to cough and sneeze. It is obtained by digesting the alcoholic extract in ether and evaporating. - Capsicum is largely employed as a condiment, acting as a stimulant and aiding digestion. For these properties it is administered as a medicine; and it is also highly useful as a gargle in malignant scarlatina. In the West Indies, for violent cases of this disease, the preparation for both uses is to infuse for an hour in a pint of boiling vinegar and water two tablespoonfuls of the powdered pepper with a teaspoonful of common salt. When cold, the liquid is strained, and given in the dose of a tablespoonful every half hour. Capsicum is said to relieve the nausea of seasickness. Its local stimulant action renders it useful in cases of atonic dyspepsia, but is contraindicated whenever there is irritation or inflammation of the stomach. It is occasionally added to bitter infusions and tinctures for the purpose of rendering them more stimulating. The dose of powdered capsicum is from 1 to 5 grs. 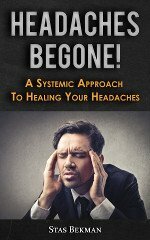 ; that of the tincture from 5 to 15 drops. It is also employed externally as a rubefacient and stimulant, either in the form of a cataplasm, lotion, or tincture. - The commercial cayenne is subject to gross adulterations. Red lead and vermilion, or sulphuret of mercury, are the worst materials introduced, and cases of poisoning are reported from this cause, both the lead and mercury having the property of aggregating in the system when taken in small quantities. They are added to keep up the color, which gradually fades with the age of the capsicum, also to increase the weight, and to disguise the other ingredients. Ochres are also employed for similar purposes; salt also, to improve the color and add to the weight. Ground rice and turmeric are more harmless additions.